Our spacious painted, mango and solid oak 10 seater dining tables are perfect for larger families or those that entertain often. Built from mango, painted hardwood, and of course, rustic and natural oak, our 10 seater dining tables are made to the strictest quality standards and exude comfort and practicality. Made to match our popular furniture ranges, there is certainly a style here to suit your home. At Oak Furnitureland, quality comes first, and so you won’t find MDF, chipboard, veneer or any inferior materials in our products. Each piece of furniture we sell is made using great cuts of solid oak and mango hardwood, all chosen for their superior colour tone and grain patterns. We see a dining table as a long-term investment, which is why all our tables are made to withstand vigorous use for decades to come. Ideal for larger families or those who love hosting special occasions, our 10 seater dining tables come in a variety of designs allowing you to find the perfect match for your home. For a table and chairs handpicked to pair perfectly, look at our sets of dining table and 10 chairs. With so many elegant 6ft dining tables to choose from, you’re bound to find a design to complement your dining area. Inspired by classic French design, the large Country Cottage 10 seater dining table features a contemporary twist with its distinctive cream painted legs, and can blend easily into both modern and more traditional kitchens or dining rooms. For something completely different, our Reflection glass large dining table is designed to show off the natural beauty of the solid oak legs and adds both sophistication and rustic charm to your home. If you happen to have a larger family, or a reputation for throwing big dinner parties, then you might want to consider the fantastic Hercules extendable dining table. At 9ft in length when extended, this statuesque piece of furniture can seat up to 12 diners and can handle those large family get-togethers with ease. Even the largest of dining tables can struggle for space when multiple guests are in attendance, so why not consider a handy sideboard to relieve some of the pressure? Built from the quality hardwood you’d expect from Oak Furnitureland, they are perfect for serving food from during larger functions. They can also be used to store plenty of plates, glasses, cutlery: all the things you need in abundance for a successful party. 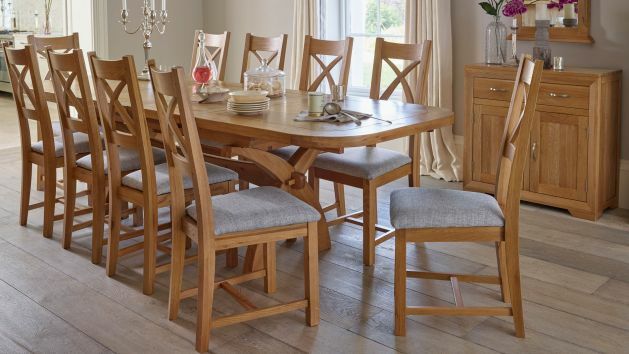 Spend over £500 on your new large dining table and you automatically qualify for one of our flexible finance options, allowing you to split the cost of your furniture into monthly instalments for up to four years. Spend over £3,500, and you can enjoy interest-free credit for up to three years, allowing you to enjoy your purchase comfortably without paying an extra penny.